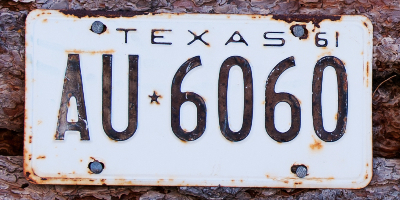 Home » FAQ » Is it illegal to drive a car without a front license plate in Texas? Is it illegal to drive a car without a front license plate in Texas? There are a number of vehicles in Texas with only one license plate mounted to the back, but is that right? We discuss some of the license plate requirements for Texas drivers that can be a little confusing below. Texas is a two-plate state. That means that all drivers need to have a license plate mounted to the front and rear of their vehicle. If you are driving without a front license plate not only are you giving police reason to pull you over but you are also risking a fine of up to $200 if they do. It’s best to head to your local service center where they can easily install a front license plate bracket for a small fee. Can I put my license plate on my dashboard? If you have a new vehicle that isn’t outfitted with front license plate brackets, it can be tempting to display your license plate in other creative ways to avoid the cost of installation or to keep your front fascia looking clean. Unfortunately, propping your license plate on your dash so it’s visible through the windshield won’t cut it. To be compliant, your license plate must be mounted on your vehicle’s exterior no less than 12 inches from the ground. Both license plates must also be easily visible. Are you in need of a new-to-you vehicle? Coast to Coast Motors operates several dealerships throughout Texas and Oklahoma that have a wide variety of pre-owned models perfect for car shoppers interested in scoring an affordable used car, truck, or SUV. Browse our inventory online or find your nearest Coast to Coast Motors dealership location and visit in person! This entry was posted on Monday, November 5th, 2018 at 6:16 pm	and is filed under FAQ. You can follow any responses to this entry through the RSS 2.0 feed. You can skip to the end and leave a response. Pinging is currently not allowed.